Make sure your mechanical system and ductwork provides clean air throughout your facility. Ductwork system for proper ventilation and air quality in a commercial facilityWith proper filtration systems, maintenance and cleanings you can provide your employees, students or tenants with better indoor air quality to reduce illness. Poor indoor air quality can cause headaches, dizziness and also may aggravate asthma and allergies. Dust can cause major problems to many microchips in computers and other equipment as well as affect the results of certain lab tests. MSA provides services to many commercial and university laboratories and computer rooms to help keep your vital equipment clean and your operation running more efficiently. Monitor the important factors of your air quality such as carbon dioxide levels and relative humidity with sensors for your building or facility manager to easily review on a regular basis. Clean and filter the ductwork of your building to reduce or prevent bacteria, pollen, dust mites, mold or dirt from adversely affecting your operations and the people in your buildings. 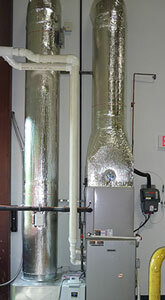 MSA can help you ensure proper ventilation that is essential to cost effective improvement of your indoor air quality. We can help you efficiently incorporate fresh air into your system to reduce the concentration of carbon dioxide or other gases, chemicals and contaminates, even in tightly sealed buildings.